Artlyst has attended the Ruskin Preliminaries 2016 to investigate the burgeoning talent that the prestigious Oxford art school may unleash upon the art world in the not too distant future, and examine the student’s potential response to the school’s historical relationship with drawing. The Ruskin dates from 1871, when John Ruskin first opened his School of Drawing, planning to develop a course for Oxford University leading to a degree in art. The school originally consisted of a teaching collection of more than 800 watercolours and drawings and more than 400 prints – originally housed in the University Galleries – these included works by Dürer, Tintoretto and Turner. Ruskin’s dream of establishing a Bachelor of Fine Art degree was finally achieved in 1978, and this became the present honours degree in 1992. We were met by artist Rufus Rock, who was kind enough to give Artlyst a tour of the undergraduate Ruskin Preliminaries exhibition, so we can bring you the highlights, suggesting a number of artists to keep an eye on in the future, as we enter degree show season. The show, consisting of the works of 29 students, represents the Ruskin’s potential contribution to the future of art, and potential is exactly what it’s all about. With a selection of works on display varying from relatively traditional abstraction to the seemingly indestructible desire to create Duchampian assemblage – the artists on display employ a plethora of devices and languages, all rather impressive considering their undergraduate nature. Image: Keira YE Jeon, Untitled, detail, 2016. Ruskin Preliminaries. Photo: P A Black © 2016. 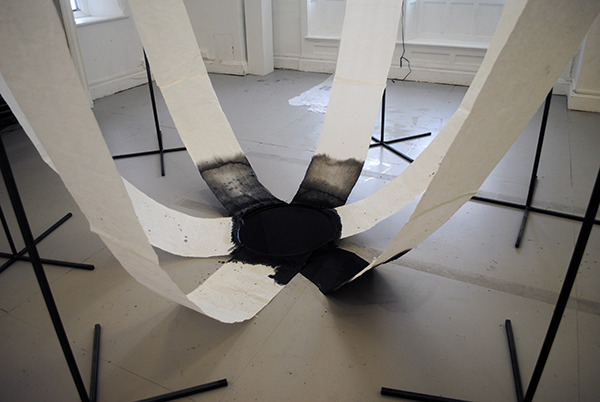 A particular work that references both the historical and contemporary concerns of this institution is an untitled work by Keira YE Jeon, consisting of six strips of paper leading from a fluid centre of ink up to six metal stands, creating a kinetic sculptural object, as the material slowly soaks up the black substance. The work simultaneously employs the languages of sculpture, painting, and the transfer of substance is playfully suggestive of the mark-making of drawing – ink on paper – tantalizing signifiers of artistic intent – a work about the nature of potential. Image: Luke Dawes, Untitled, detail, 2016. Ruskin Preliminaries. Photo: P A Black © 2016. Luke Dawes employs materiality and weight in a juxtaposition between the material and substance of canvas and paint, manipulating material by literally weighing the work down, grounding the artist’s floor-based works with actual ropes and weights, transforming the ethereal and lofty goals of abstraction and mark-making, with the corporeal physicality of the sculptural via a clean juxtaposition of languages. Image: Rufus Rock, Bodies Politic, detail, 2016. Ruskin Preliminaries. Photo: P A Black © 2016. 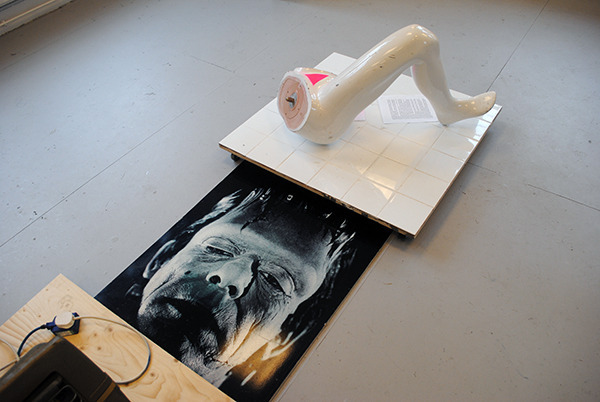 Our guide for the day, and artist, Rufus Rock, presents a floor-based work ‘Bodies Politic’, employing a Duchampian take on objecthood and the language of assemblage, to present sculptural objects, images, the kinetic, and even the moving image as artefacts resulting from performance. As stated Rock’s work is in actual fact a Duchampian assemblage of artefacts derived from the artist’s performance concerning a do-it-yourself HIV test. The face of Boris Karloff’s iconic Frankenstein glares forth as a signifier of physical corruption – while an electric heater warms the air – all forming a prone body in the midst of deconstruction. A similarly disembodied Mannequin’s leg sits ontop of a square of bathroom tiles, with a slightly clinical porcelain sheen – the only thing missing from the work could be the written words ‘R. Mutt, 2016’ – but this time signed with a very contemporary lipstick. 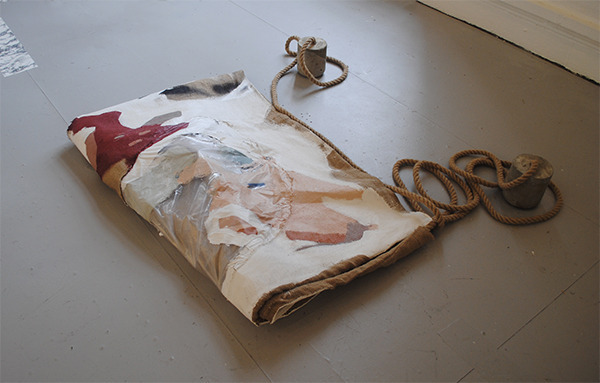 This is a strong undergraduate exhibition, employing an array of languages and an already impressive ability to juxtapose them with deft coherence, reflecting multi-disciplinary approaches to the artists practices that puts these undergraduates on the right track for the future – and Artlyst looks forward to following all of those futures up to their final degree show – and hopefully beyond. Eleanor Begley, Zhiyi Cao, Ivy CY Chang, Briana Che, Kitty Chew, Hannah Chilver-Vaughan, Marisa Crane, Luke Dawes, Jose Mario Dellow, Poppy Eastwood, Jessica Evans, Anisha Grover, Jessica Heywood, Hanna Høibø, Nour Jaouda, Keira YE Jeon, Ella Joyce, Yves Leather, Iman Mahdy, Spike McCormack, Irina Mihaela, Hattie Morrison, Guillermo Pernas Chamorro, Emily Pullen, Daisy Smith, Asiyla Radwan, Elaine Robertson, Rufus Rock, Amanda Ross.